A nursing student of the Good Samaritan School of Nursing works with a patient on post-surgical physical therapy. This photograph was previously adhered to the Obstetrics and Surgery page of the Annual. Please see the Related Resource field to identify the scrapbook page it is associated with. Linfield College-Good Samaritan School of Nursing Collection. Jereld R. Nicholson Library. Linfield College, McMinnville, Oregon. Deposited by the Linfield College-Good Samaritan School of Nursing. For a related image, refer to The Obstetrics and Surgery Page of the Annual. 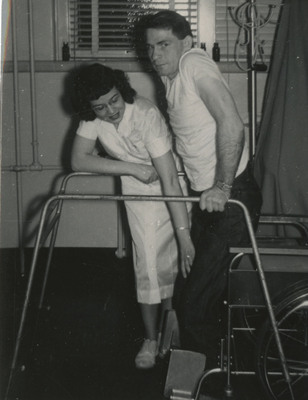 Unknown, "Nursing Student Helping with Physical Therapy" (1951). Good Samaritan School of Nursing Photographs. Image. Submission 188.